The project marks one of the largest single company textile diversion programs in U.S. history where no items will go to landfills or incineration. When 64,000 Delta employees in Airport Customer Service, Cargo, In-flight Service and TechOps headed to work in their new uniforms on May 29, over 1 million pieces of their old uniform were retired. To prevent those uniforms from ending up in landfills, more than 350,000 pounds of clothing have been donated to be upcycled and repurposed by Delta’s partner, Looptworks. More than 15 million tons of used textile waste is generated each year in the United States. Once in landfills, decomposing textiles release methane, a harmful greenhouse gas. Furthermore, dyes and chemicals in the fabrics leach into the soil and both surface and groundwater, which contributes to habitat degradation. Following the launch of the new uniform, collection boxes were placed in more than 90 cities around the Delta system. In the days ahead, Looptworks will transform any retired pieces that cannot be donated or reused through upcycling or down-cycling. Many textile “recycling” projects resell some fabric parts while selling the rest as incineration fuel, but the Delta and Looptworks campaign takes a different approach, marking one of the largest single company textile diversion programs in U.S. history where no items will go to landfills or incineration. “The value of this collaboration goes beyond waste diversion and the reuse of upcycled items. It also conserves a significant amount of water and eliminates carbon emissions,” said Scott Hamlin, sustainability expert and CEO of Looptworks. Additionally, partnering with Looptworks in the collection process is Relay Resources and the Bobby Dodd Institute. Local to Portland, Relay Resources has helped with sorting, deconstruction and warehousing donations received from Delta’s western domestic stations. It creates employment opportunities for over 700 refugees, workers with disabilities, ESOL speakers or people in challenging scenarios. In the east, Bobby Dodd also supports Delta’s mission to give back to its community by employing more than 200 people with disabilities and or veterans with disadvantages in Atlanta. Donating items in good condition will give back to those in need. 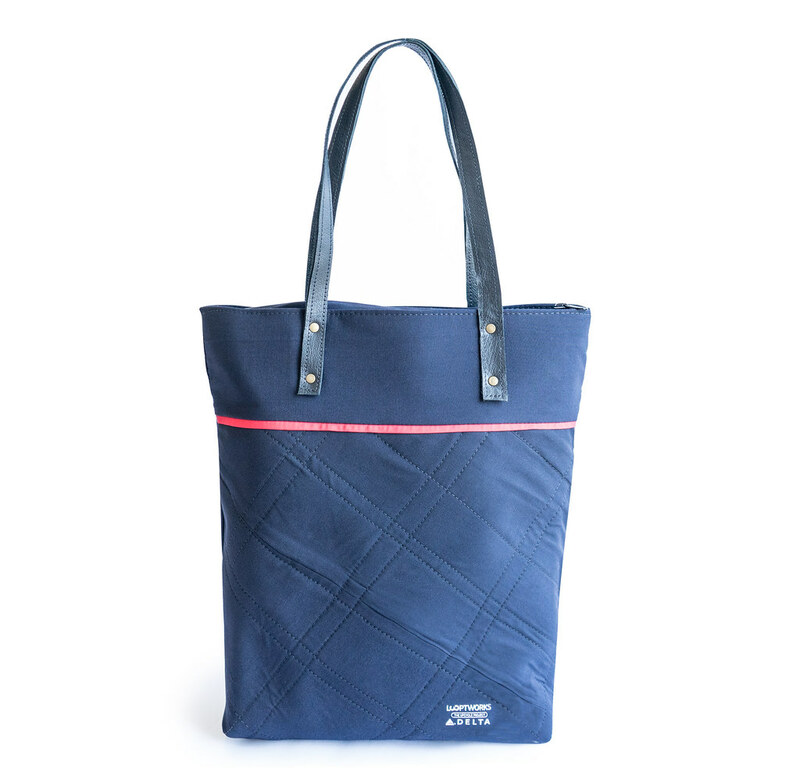 Upcycling, or taking material that is set to be destroyed and using it to create a new product, will transform the former uniform pieces into items for purchase this October like laptop bags, travel kits and passport covers. Down-cycling, or converting material into something of lesser value, will be used to turn leftover fabric into home insulation, punching bag contents and pet bed stuffing. To add durability, leather from retired aircraft seats will be upcycled and woven into select products included in the Delta collection, which will be available for purchase this October. And, organizations can reach out to Looptworks in the meantime to nominate groups in need of the clothing donations. This is not Delta’s first time upcycling uniforms. Prior to the new uniforms being released, the prototypes used for wear-testing were donated to re:loom, an Atlanta organization, where weavers designed and produced handmade products such as rugs, keychains and more. Delta and Looptworks have revealed two signature items of the collection that will include backpacks, passport covers, other bags and accessories available in the Fall.